This kit includes everything you need, aside from tools and coils, to make a SpoolinUp style COP system. 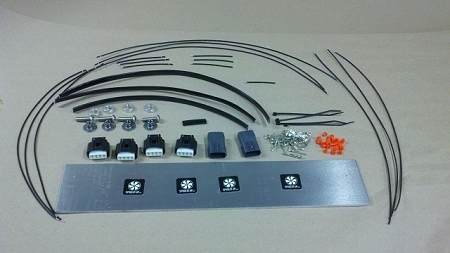 The kit includes a marked but un-drilled aluminum plate, pre-cut and stripped wires, pre-cut wire sheath, connectors, terminals, mounting hardware and directions (stickers are no longer included due to DIY systems attempting to be passed as production systems). Choose 90919-02240 for a kit similar to the New Coil COP, these coils fit under the stock ignition coil cover. The easier to find and cheaper 90919-02244 coils will look like my Used Coil Systems, these coils do not fit under the stock ignition coil cover. The Blank Aluminum Plate is fully marked, you do the work. The Satin Black plate is the same one I use on my Production COP Systems, all the work is done for you!